Ar an Satharn thug an Dr Séamus Ó Flaithimhín, Ollamh Emeritus, Ollscoil na hÉireann, Gaillimh, léacht eolgaiseach ar an scoláire ildánach, An Monsignor Pádraig de Brún (a tháinig ó dheiseart Thiobraid Árann). Tá léabhar is fiche foilsithe ag Áine Ní Ghlinn ó Crois an Ghúlaigh, Co Thiobraid Árann. Is í a thug Ceardlann Filíochta do dhaltaí scoile, a léigh a cuid filíochta agus a sheol urscéal nua le Liam Prút dar teideal “Sna Flaithis go hArd” don slua. Dhein an Dr Nóirín Ní Riain staidéar ar an gceol faoi Sheán Ó Riada. Labhair sí ar an tionchar a bhí ag Ó Riada uirthi mar cheoltóir. Ag deireadh na hoíche leirigh Buíon Phádraig, Luimneach an drama “Na Mangairí,” cóirithe ag Seán Ó Morónaigh. 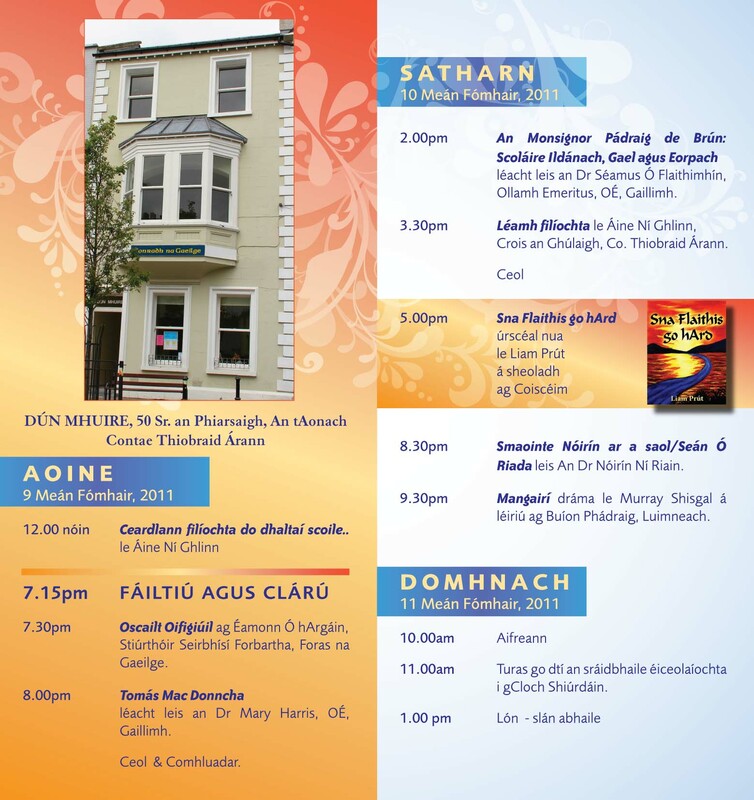 Dé Domhnaigh thugamar cuairt ar an sráidbhaile éiceolaíochta nua i gCloch Shiúrdáin mar ar stiúraigh agus ar mhínigh Anne Marie Nugent an ailtireacht, an éiceolaíocht agus an saol laethúil san áit nua-aoiseach dúinn.